We are terribly spoiled, having the two greatest footballers of the modern era playing at the same time in the same league. As fans this allows us to marvel at the immense talents of Lionel Messi and Cristiano Ronaldo, the only two genuine contenders to Pele and Maradona for the title ‘greatest of all time’. As analysts it allows us to compare them, like-for-like, because they operate in the same arenas every week. Such a comparison is never more appropriate than today, when the 2015 Ballon d’Or will be awarded. It will go, inevitably, to Messi. And so it should. Ronaldo won it first, in 2008. Then Messi in 2009, 2010, 2011 and 2012. Ronaldo took it back in 2013 and 2014. 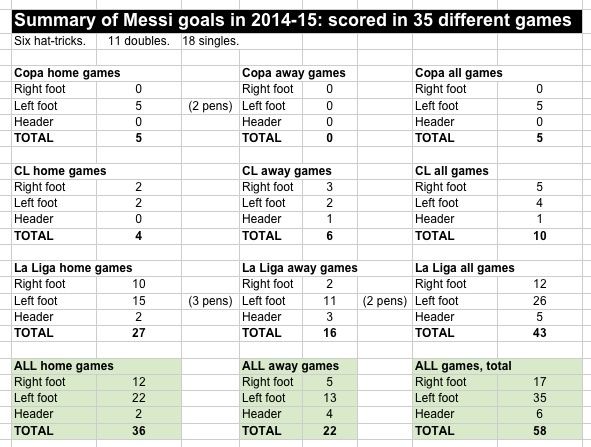 But there is not a sliver of statistical doubt that Messi warrants it for 2015, as the analysis below will prove. There is a clear case for the Argentinean being the superior player in almost every way you can imagine over the duration of his rivalry with Ronaldo, if not for all of every season within it. In this piece, we will examine their performances in La Liga for every game between summer 2009 — when Ronaldo joined Real Madrid from Manchester United for £80m — to the end of calendar year 2015. Messi, of course, was playing at Barcelona for that whole period. We concentrate here on open play data, where the influence of set pieces – corners, free kicks and penalties, all of which can affect statistics unevenly – are removed. Special attention is later given to the 2014-15 season because achievements in that campaign will be among the primary considerations in awarding this Ballon d’Or. Some of the findings might surprise you. All of them should underpin why Messi deserves this latest honour in a career of so many. 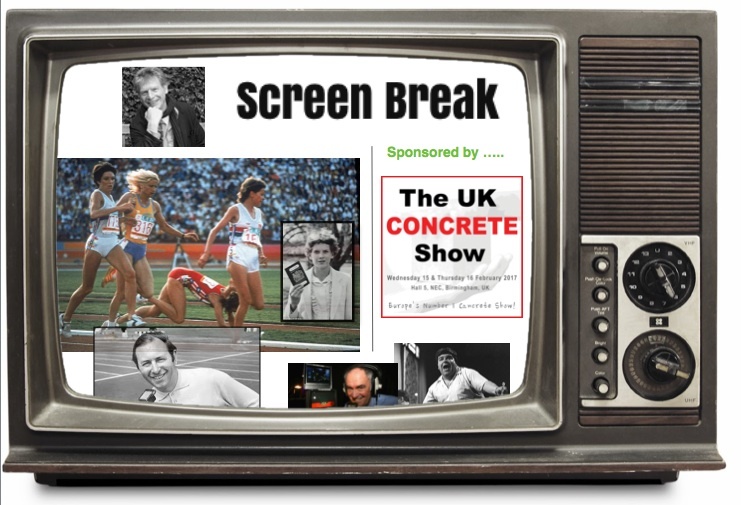 The overall production of goals from this genius pair is both stunning and similar. Since joining Real Madrid, Ronaldo has scored 338 goals in 325 appearances in all competitions, at a rate of 1.04 goals per game. In the same period, Messi has scored more often, or 350 goals, up to and including his latest hat-trick against Granada on Saturday, in a few more games, 342, at a rate of 1.02 goals per game. For context, the two most prolific top-level goal scorers in the history of football, according to the RSSSF and counting only official matches, were Brazilians Romario (772 goals in 994 games) and Pele (767 goals in 831 games). 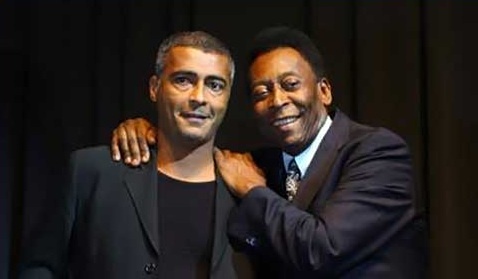 That gives Romario a rate of 0.78 goals per game and Pele a rate of 0.92. So a rate of more than one per game over multiple years for Ronaldo and Messi at the level where Real Madrid and Barcelona operate is frankly outrageous. But let’s consider our core data, which is La Liga goals since summer 2009. Over the seven-and-a-half seasons of data examined, only three goals separate the players’ totals: 240 goals for Ronaldo and 237 for Messi. 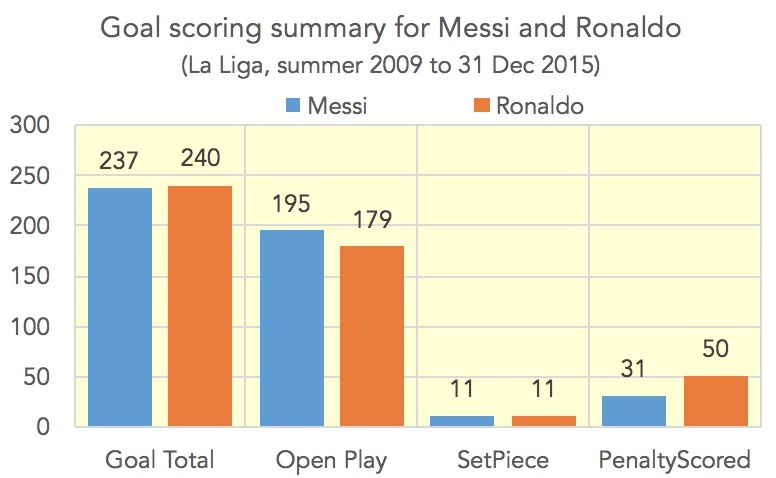 Considering only the open play goals – the primary focus of this article – and these totals reduce to 179 for Ronaldo and 195 for Messi. The change in dominance is simply due to the larger number of penalties accumulated by Ronaldo. But it isn’t the goal count difference between the two that is the critical metric of contrast. Rather, it is the way that their goals are achieved that differentiate them. Ronaldo took 1,517 shots to score his 240 goals against 1,079 shots by Messi to score his 237 goals. That’s 41 per cent more shot attempts to score three more goals. From open play, Ronaldo took 1,326 shots to score 179 goals against 956 shots by Messi to score his 195 goals. That’s 38 per cent cent more shots to score 16 fewer goals. 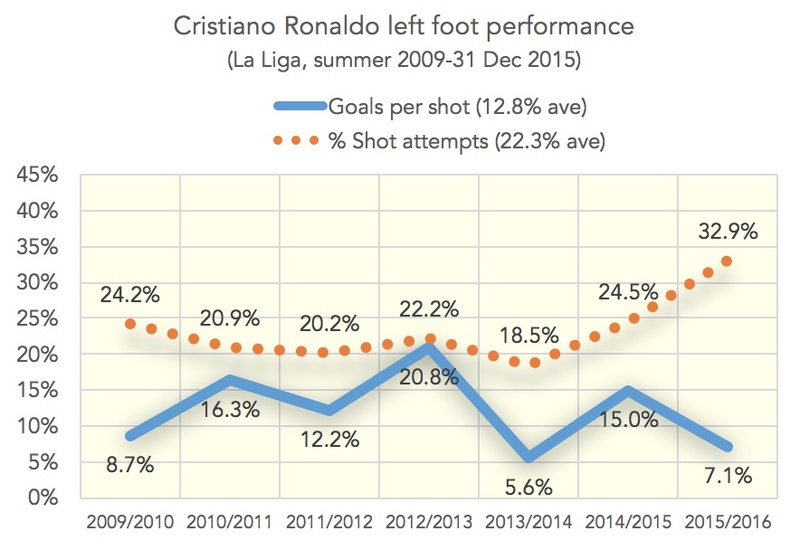 Ronaldo requires a considerably higher volume of attempts to generate goals. 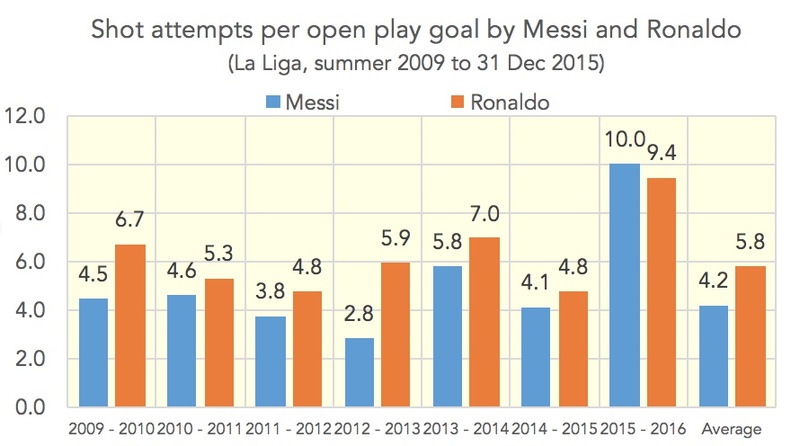 In the period under review, more than seven years, Messi has needed an average of just 4.2 shots per goal, against Ronaldo’s 5.8 shots per goal in the same period. These differences in performance are statistically significant. Think of it this way: in order to score 10 goals, Ronaldo will need to take an average of 58 shot attempts while Messi can achieve this same outcome in 42 shots. Nor has there been a single completed La Liga season in which Ronaldo has taken fewer shots per goal than Messi. In Ronaldo’s best seasons, 2011-12 and 2013-14, he took 4.8 shots per goal but Messi was taking 3.8 and 4.1 respectively those years. And while Ronaldo’s shots to goal ratio has been as high as 7 shots per goal in 2013-14, Messi’s has never been higher than 5.8 (that same season) while going as low as 2.8 shots per goal, in 2012-13, which is ludicrous. Both players score a large proportion of their goals inside the penalty area. 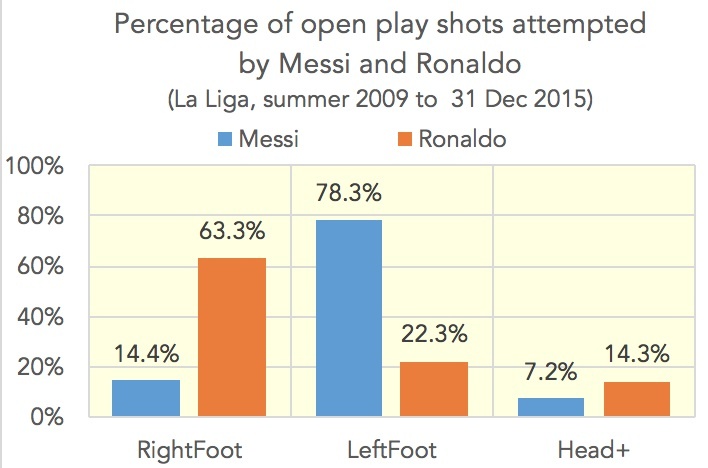 Just 22 of Messi’s goals in our study came from outside the area, and 23 of Ronaldo’s. However, a closer examination of the shots-to-goal ratio by pitch location provides another layer of information. 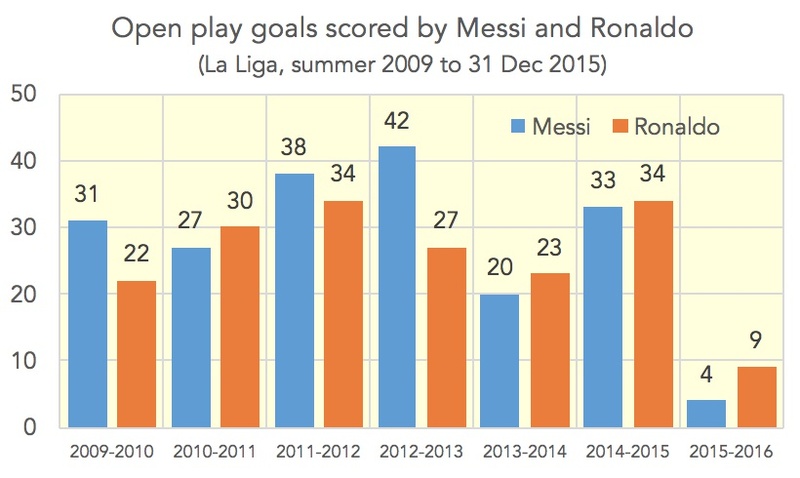 Messi dominates Ronaldo in scoring goals more efficiently from everywhere. Messi needs just two shots per goal in the six-yard box (2.5 for Ronaldo); and fewer than five per goal in the penalty area (5.9 for Ronaldo). 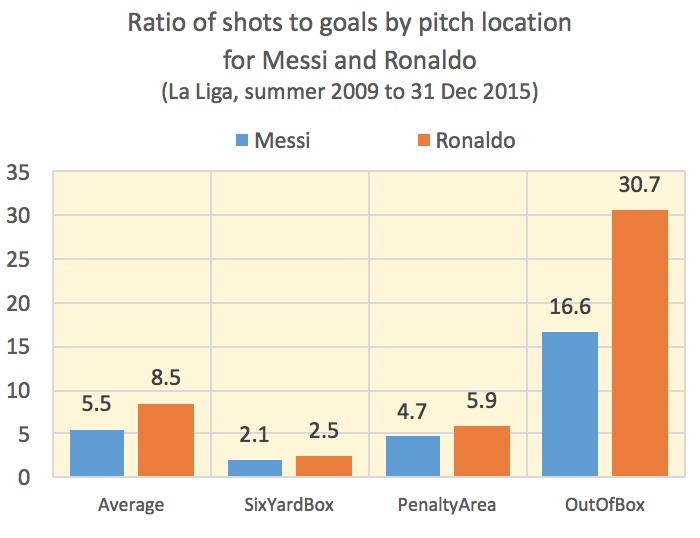 But it’s outside the area where Messi is most relatively efficient, taking only just over half as many shots per goal (16.6) as Ronaldo (30.7). Common perception has it that Messi is a one-footed player and Ronaldo is two-footed and also magnificent with his head. Certainly when we consider the attempted open play shots by both men, there is a degree of corroboration in the data. But only a degree. All of his attempted 956 shots, Messi makes 78.3 per cent of them (or 749 attempts) with his preferred left foot, and 14.4 per cent with his ‘weaker’ right foot (138 attempts), and 7.2 per cent with his head (69 attempts). ‘Two-footed’ Ronaldo makes a sizeable majority of his 1,326 attempts with his right foot (or 839 attempts, or 63.3 per cent of them), 22.3 per cent with his left (296 attempts), and almost double the proportion of Messi with his head (191 attempts, or 14.3 per cent of all attempts). It might be reasonable to assume, if Ronaldo is really two-footed, that he will also be more productive with his ‘wrong’ foot, namely his left foot, than Messi is with his wrong foot, namely his right foot, correct? That’s not the case at all. Messi is an assassin with his right foot. 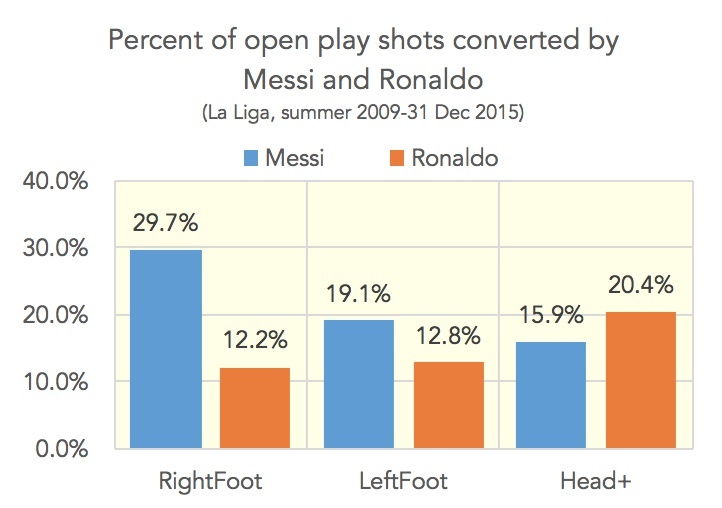 In fact if you consider which of the six ‘weapons’ shared between Messi and Ronaldo is the singularly most lethal — Messi’s left foot, his right foot or his head, Ronaldo’s left foot, his right foot or his head –then the answer is … Messi’s right foot. Staggeringly, he converts almost three in 10 of his right-footed open play shots (29.7 per cent) into goals. The next most lethal weapon of the six is Ronaldo’s head (20.4 per cent conversion rate) then Messi’s left foot, Messi’s head, Ronaldo’s left foot and Ronaldo’s right foot. But what about the return on these efforts? What is the tangible output? Messi scores more than one-fifth of his goals with his right foot, or 41 from 195, for 21 per cent, despite attempting shots with it only once every seven shots (14.4 per cent of the time). He makes attempts with his ‘strong’ left foot 78 per cent of the time but scores ‘only’ 73 per cent of his goals with it. He makes 7 per cent of his attempts with his head, but scores ‘only’ 5.6 per cent of his goals with his head. Ronaldo, by contrast, makes 63.3 per cent of his attempts with his right foot but scores ‘only’ 57 per cent of his goals with it. The balance of his goals is split pretty evenly between his head (39 goals, or 21.8 per cent) and his left foot (38 goals, 21.2 per cent). So which ‘weak’ foot is stronger? Doh! As if we need to ask that question. On the basis that Messi’s ‘weak’ foot is his right, because he uses it so sparingly, and on the basis that Ronaldo’s is his left, for the same reason, the clear winner is Messi, again. 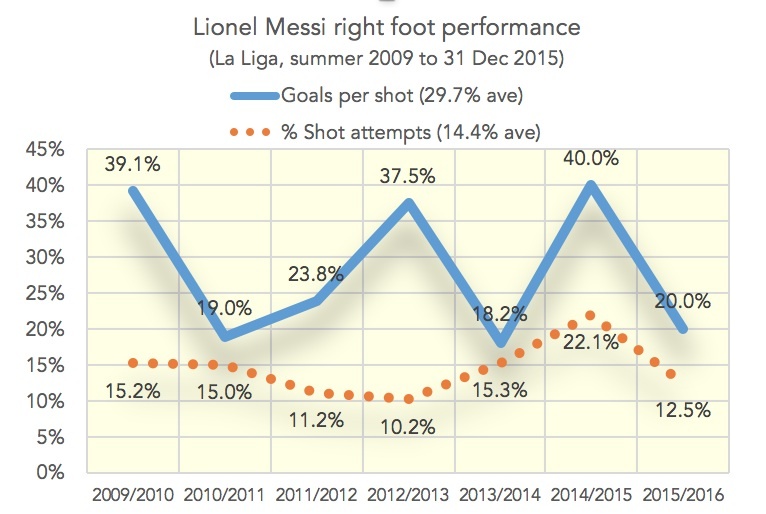 Messi’s conversion rate with his ‘weak’ right foot has been as high as 40 per cent (last season). Ronaldo’s conversion rate with his left foot has never been higher than 20.8 per cent (in 2012-13). Both Messi and Ronaldo are skilled at moving the ball around the pitch. But is there much of a difference in terms of these passing skills? Again, yes. 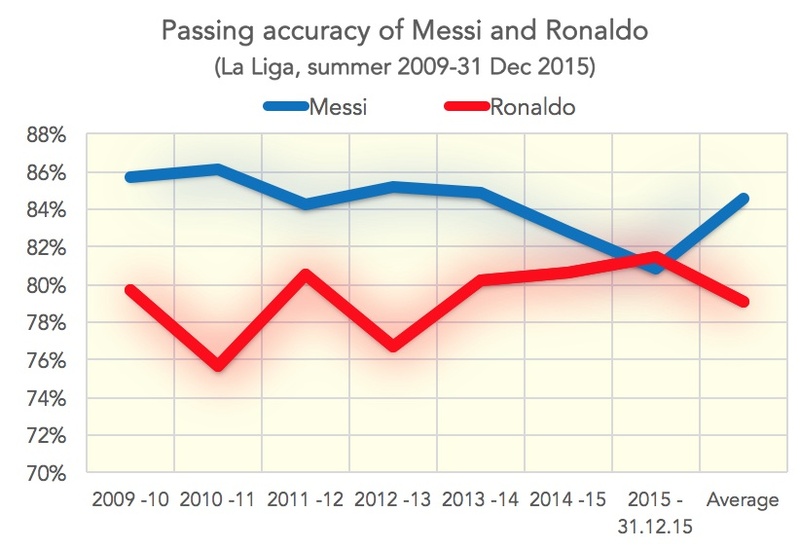 Messi provides a higher level of service both in terms of (1) numbers of completed passes and (2) accuracy of passes. 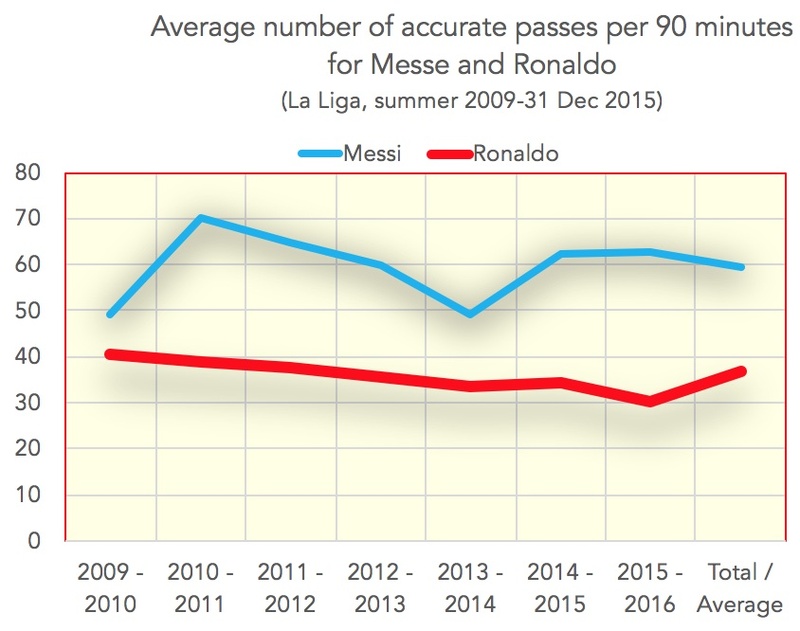 Messi’s average 59.3 completed passes per 90 minutes and 84.6 per cent overall passing accuracy easily overshadows the 36.7 completed passes per 90 and 79.1 per cent accuracy delivered by Ronaldo. 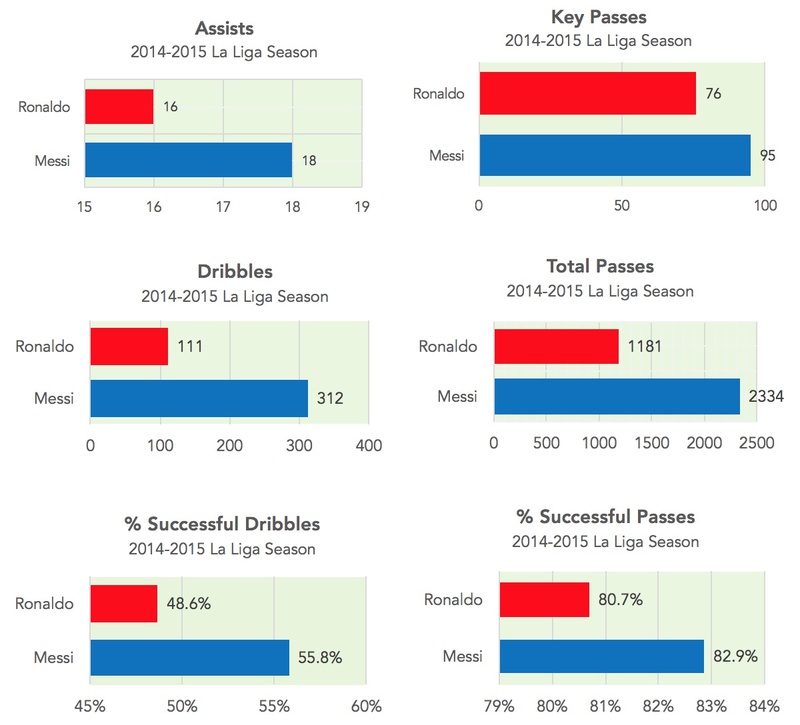 Messi’s numbers provide a statistically significant difference in both of these categories. Ronaldo, like many goalscorers, has a reputation for being selfish with the ball, however I am not convinced it is fairly earned. The numbers here seem to bear witness to this scepticism. It is extremely rare to encounter goalscorers who average more than 10 assists per season for seven seasons and provide the level of key passes that are more frequently associated with a team’s central midfielder. Ronaldo’s numbers show 10.8 assists per season and almost 65 key passes. But, once again, Messi’s numbers are better, at 14.2 assists per season and more than 70 key passes. 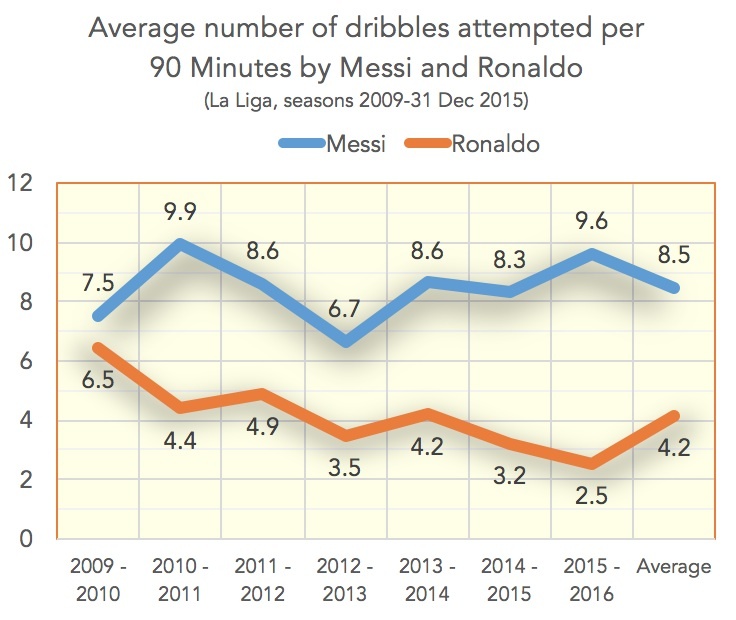 Messi is also better at dribbling both in quantity and efficiency. He averages 8.5 attempted dribbles per 90 minutes and has a rate of success of 59.1 per cent compared to Ronaldo’s average of 4.2 dribbles per 90 minutes and a 49.4 per cent success rate. Evidently, Ronaldo’s numbers are excellent.Magnificent. World-beating. But not as good as Messi’s. Tonight’s award will be made on the back of a 2014-15 season in which Messi scored 58 goals in all competitions for Barcelona. They won La Liga, the Copa and the Champions League. 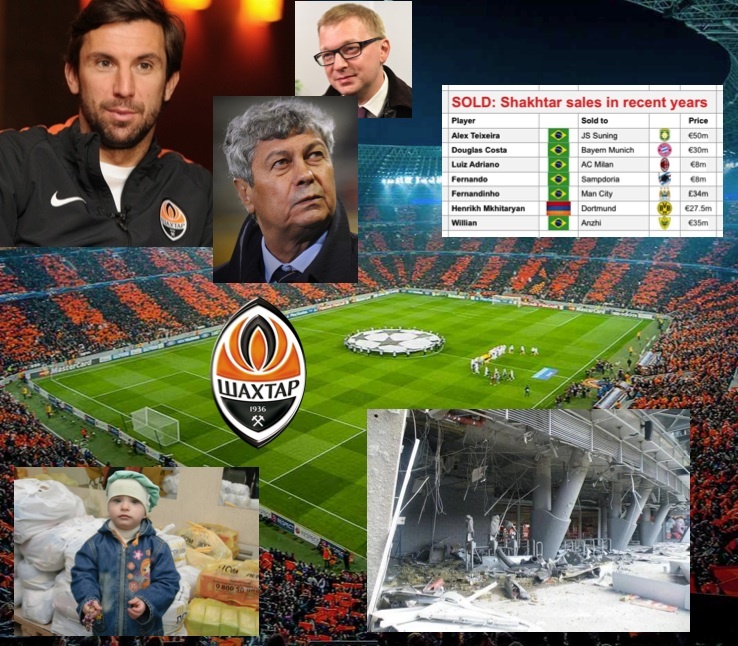 Later in the calendar year they add the UEFA Super Cup and the FIFA Club World Cup. And head to head with Ronaldo? There’s only one winner. Only one Messi. 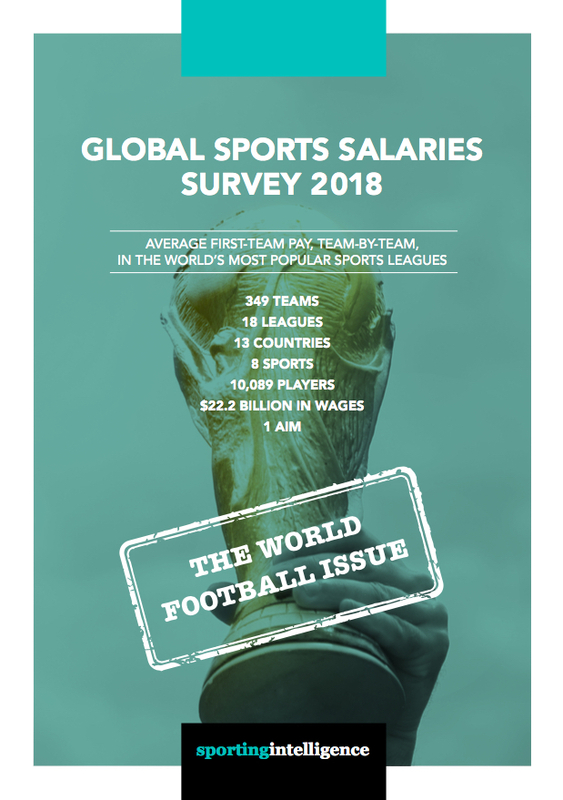 Joel Oberstone is a professor of Business Analytics at the University of San Francisco, School of Management and is also Principal Analyst at Enlighten Sports Analytics, where he applies his skills assessing player and team performance from the top five European football leagues. 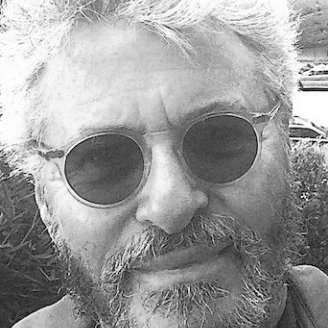 He formerly wrote a weekly column for the Wall Street Journal Sports Europe. 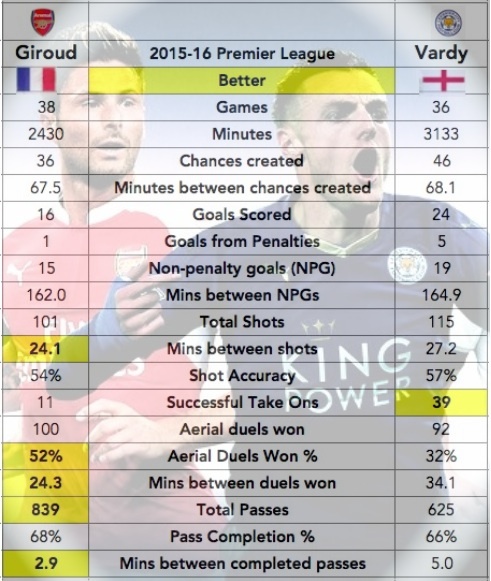 The data used in this piece was sourced from WhoScored.